How to customize Ranger User Sync for either UNIX or LDAP/AD when installing Ranger via Ambari. You can customize User Sync for either Unix or LDAP/AD. Before committing to usersync changes, it is recommended that you test-run that users and groups are being retrieved as intended. Set ranger.usersync.policymanager.mockrun=true. This parameter can be found in Ambari> Ranger> Configs> Advanced> Advanced ranger-ugsync-site. View the Users and Groups that will be loaded into Ranger: tail -f /var/log/ranger/usersync/usersync.log. After confirming that the users and groups are retrieved as intended, set ranger.usersync.policymanager.mockrun=false and restart Ranger Usersync. This will sync the users shown in the usersync log to the Ranger database. 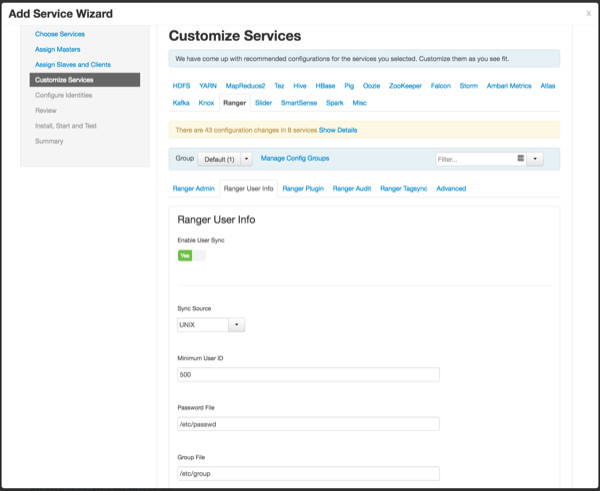 On the Customize Services page, select the Ranger User Info tab. Click Yes under Enable User Sync. Use the Sync Source drop-down to select UNIX, then set the following properties. Use the Sync Source drop-down to select LDAP/AD. Set the following properties on the Common Configs tab. Bind User Password The password of the Bind User. If Yes is selected, Ranger Usersync saves the latest timestamp of all the objects that are synced previously and uses that timestamp to perform the next sync. Usersync then uses a polling mechanism to perform incremental sync by using LDAP attributes uSNChanged (for AD) or modifytimestamp (for LDAP). Enabling Incremental Sync for the first time will initiate a full sync; subsequent sync operations will be incremental. When Incremental Sync is enabled, Group Sync (under the Group Configs tab) is mandatory. Set the following properties on the User Configs tab. Ranger can search multiple OUs in AD. 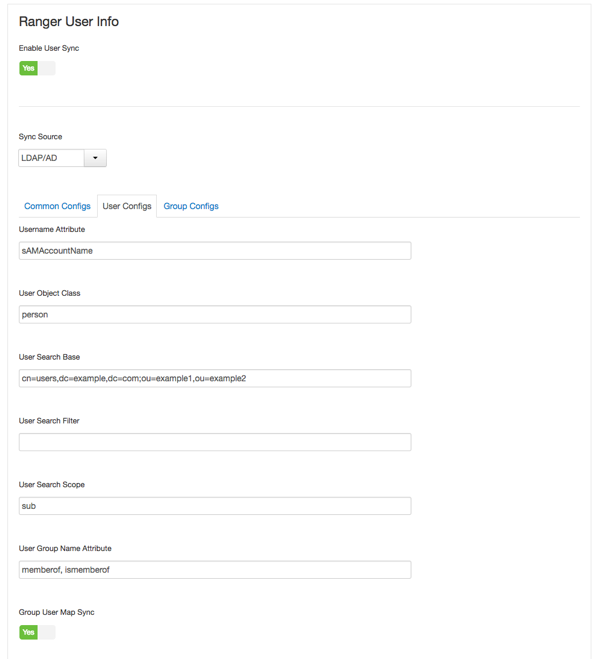 Ranger UserSync module performs a user search on each configured OU and adds all the users into single list. Once all the OUs are processed, a user’s group membership is computed based on the group search. User Search Filter Optional additional filter constraining the users selected for syncing. Set the following properties on the Group Configs tab. If Enable Group Sync is set to No, the group names the users belong to are derived from “User Group Name Attribute”. In this case no additional group filters are applied. If Enable Group Sync is set to Yes, the groups the users belong to are retrieved from LDAP/AD using the following group-related attributes. Enabled by default if "Incremental Sync" is enabled under the Common Configs tab. Ranger can search multiple OUs in AD. 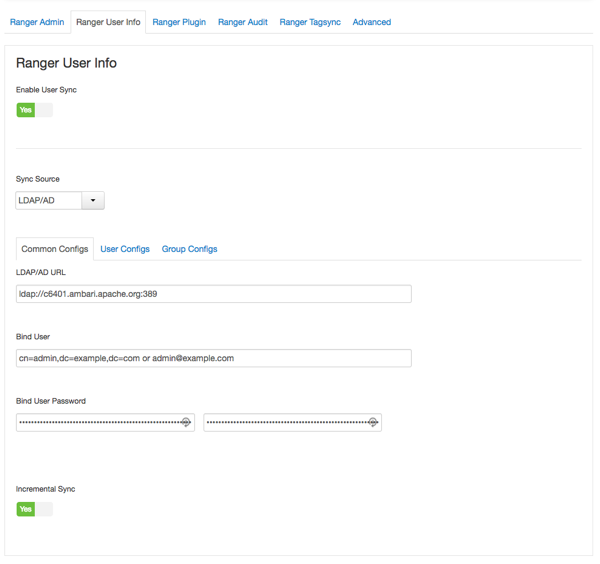 Ranger UserSync module performs a user search on each configured OU and adds all the users into single list. Once all the OUs are processed, a user’s group membership is computed based on the group search configuration. Each OU segment needs to be separated by a ; (semi-colon). 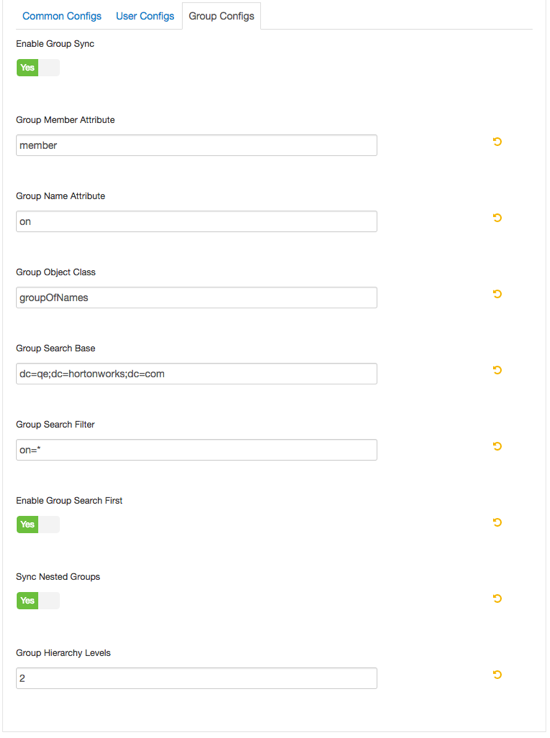 Group Search Filter Optional additional filter constraining the groups selected for syncing. If Enable User Search is not selected: users are retrieved from the “member” attribute of the group. If Enable User Search is selected: user membership is computed by performing an LDAP search based on the user configuration. Enables nested group memberships in Ranger so that the policies configured for parent groups are applied for all the members in the subgroups. If a group itself is a member of another group, the users belonging to the member group are part of the parent group as well. Group Hierarchy Levels determines evaluated nested group depth. If you do not see the Sync Nested Groups flag, upgrade to Ambari 2.6.0+. Determines how many nested groups to evaluate in support of Sync Nested Groups. If Group Hierarchy Levels is greyed out, enable Sync Nested Groups. Set to any integer >0.